professional hair coloring. It contains no ammonia, resorcinol and paraphenylendiamine. Lets get bright and shiny reflections in addition to ensuring the comfort of the scalp and nourish the hair fiber. 100% coverage of white hair. Shades are 59 shades : 3 SUPERLIGHTENERS, 2 TONALISERS, CONCENTRATORS 4, 9 NATURAL GOLDEN 6, BROWN 3, 7 COLORS FASHION, 6 ASH, MAHOGANY 6 - PURPLE, RED 7, 6 COPPER COPPER. 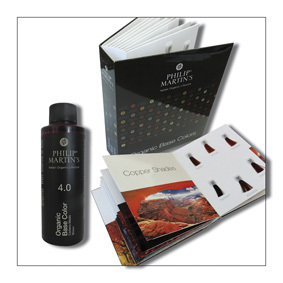 method of use : Philip Martin's coloring is applied, after appropriate oxidant mixed with 1:1, on unwashed dry hair. Exposure time 35-40 minutes at room temperature or 20 minutes at room temperature + 10 minutes under a heat source. At the time of the rinse to add a small amount of warm water and massage all areas of the hair. Rinse thoroughly with warm water and finally proceed with a shampoo acid and restructuring.